Now we are well into December, you may feel like a brief respite from the endless Christmas shopping. With the current improvement in the weather it is worth considering taking time off to indulge in a few hours fly fishing in the winter sunshine. We are open until the end of December. We will be closed in January and February and reopen again for the start of the new 2013 season on Friday 1st March 2013. 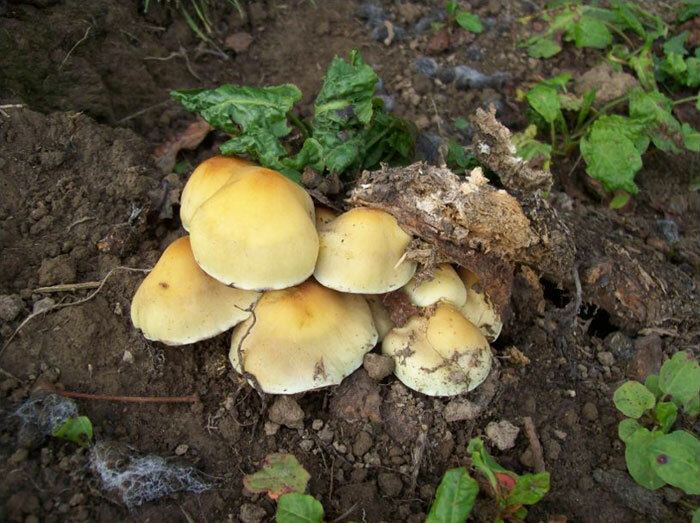 This is a good time of year for the so called 'experts' to hunt for mushrooms. 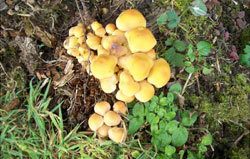 There are lots of edible fungi that can be found around the reservoir, both in the open and in the surrounding woods. 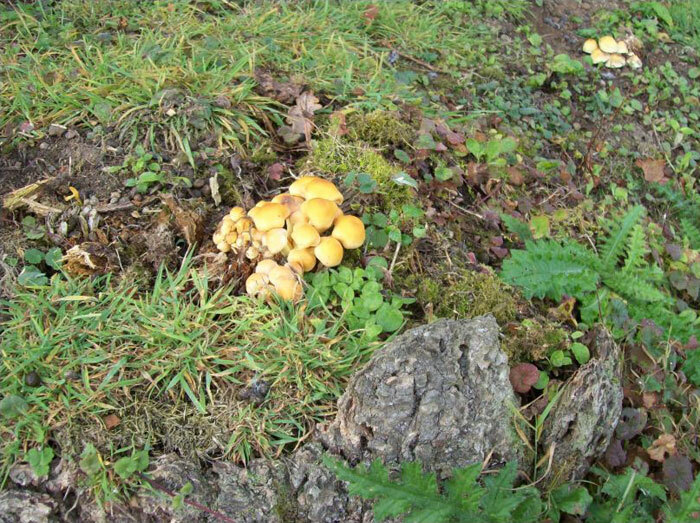 However, please beware as if you are not absolutely sure that the mushroom is safe to eat you could be taking a serious risk. I was prompted to issue this reminder having met an excited walker carrying a couple of very large, white button shaped mushrooms which to my inexperienced eye looked potentially very tasty. In conversation, it became evident that he thought that they were perfectly ok to eat but he really was no expert and was not really sure yet was happy to 'risk it' as they looked too good to pass over. 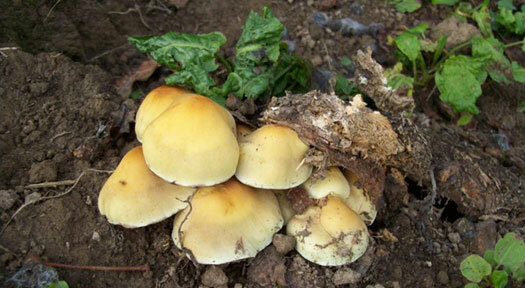 Mushrooms can even be found along the dam (see photos) and it is very tempting to pick them. Now, people who know me can confirm that it is not like me to ignore food, especially if its free, but even I have the sense to realise that I don't know enough to risk a poorly tummy or even worse! Given the frailty of the majority of fly fishermen who fish at Powdermill, anything that upsets their delicate balance could prove fatal. So the answer is to admire the flora and fauna but do not follow the example of the foolish walker. So what about the fishing? If I had not seen the fish go into the reservoir, I would be sceptical as the fishing has continued to be very hard. However, virtually everyone has fished from the dam and even the boat anglers have not ventured far. I am beginning to wonder if the majority of fish have migrated to the far end of the reservoir where nobody has bothered to go in recent weeks. Hopefully, someone will find where they are and give the rest of us a clue. The mystery of the elusive fish continues. Despite the influx of new fish the fishing is still demanding but fish are being caught despite the generally miserable wet and windy weather. Most anglers are opting to fish from the bank with the majority fishing the dam. As a result, wind direction is an important factor and with the recent strong winds blowing onto the dam, life has not been easy. However, the more settled spells of weather can prove to be pleasant as well as productive. 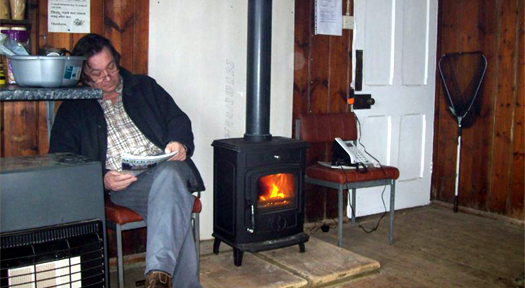 Those of us who refuse to subject ourselves to the vagaries of the weather have been trying to keep warm in the lodge despite the lack of dry wood. Yes, we have still not got around to building a store for our stash of logs. As a result, lighting the fire has not been an easy task. In an attempt to cut small pieces of wood into even smaller pieces for kindling using a penknife, Lee Partridge, Vic's son, managed to slice a finger down to the bone - hence the blood on the floor in the sitting room. Yes, it was pretty nasty. This just goes to prove that it is safer to brave the elements than retreat to the apparent comfort of the lodge. We will remain open for fishing during November and December. Winter prices will apply during this period. With water conditions now ideal for the existing trout stocks and the recent heavy stockings, we expect the fishing to be very good for the next couple of months. 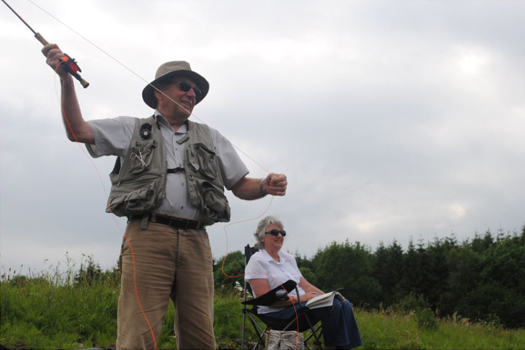 We hope that the fish will co-operate and enable both visitors and members to take this opportunity to enjoy some exciting winter fly fishing. 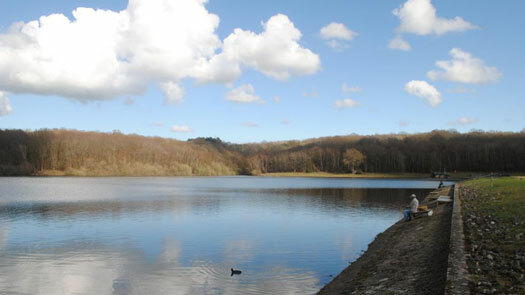 The reservoir will be closed for fishing during January and February and will reopen on Friday 1st March 2013. At this time of year, if you arrive early in the morning when the mist is rolling down the back of the dam, you may see a bit of rabbiting taking place. The burrows go deep into the bank and, in theory, the excavations actually endanger the stability of the dam itself. The field below the dam has numerous ant hills and in order to protect them, Southern Water are not allowed to mow the area. No doubt someone will inform me why the ant population is protected. The absence of any ground maintenance results in the whole area being an ideal habitat for the rabbit population which continues to grow. 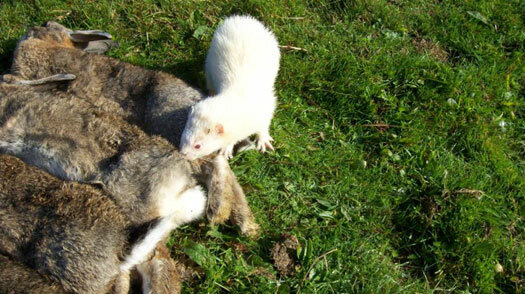 Hunting them using a ferret is a time honoured country tradition which is quite amusing to watch as the old boys are a bit slow and most escape. With the delivery of yet another batch of perfectly proportioned rainbows I am very excited about the fishing prospects for the remainder of the year. Well, not exactly excited enough to actually go fishing myself, but excited for the rest of you. The reservoir is full, the water is clear and cold enough for the fish to now be very active and looking for food. Conditions are ideal. So why am I not out there when I am encouraging you to risk the uncertain weather in November and December? Should one not lead by example? One of my many duties is to look after the old and decrepit who can be found most mornings discussing the various topics of the day by the fire in the fishing lodge. So, while you will be out freezing your b******* off, I will be forced to remain snug and cosy, basking in the heat from the wood burner. Therefore, if your not up to facing the bracing weather and fit into the newly formed 'Age UK' category, why not join the throng with nothing better to do while waiting for a place in a care home. However, if you are still reasonably active why not join those other unfortunate anglers who feel obliged to catch fish. With the decision to keep the reservoir open until the end of December, it was necessary to start carrying out a program of restocking. After the difficult summer, when the fishing was particularly hard, fish are now coming back onto the feed. It is therefore an ideal opportunity to boost stocks and significantly improve catches. 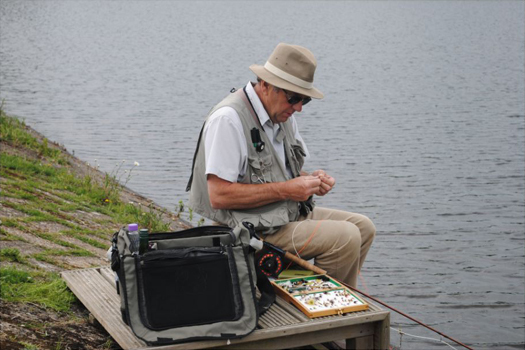 Although the weather can be very changeable at this time of year, we can expect to have some days when conditions are ideal for a spot of fly fishing, even for those of us who are fair weather anglers. You now have an opportunity to enjoy a bit of late season fly fishing at one of the most beautiful waters in the South East... and catch fish! 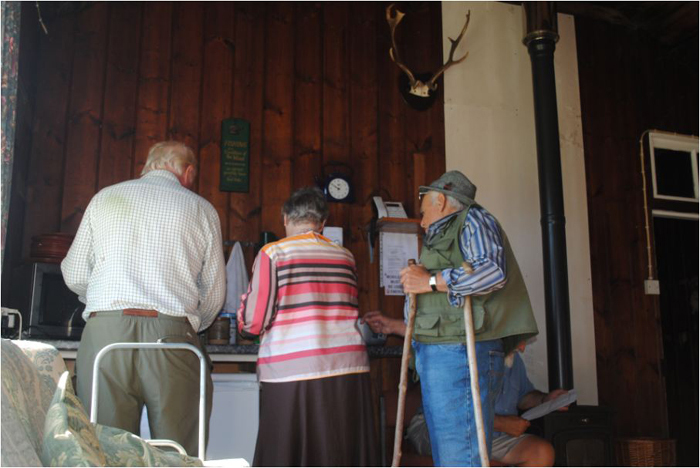 Regular visitor, Colin Fagg, (Top) can still find the fish and catch them, despite the warm water and generally difficult conditions. He's certainly no slacker and works hard for as long as it takes to catch his fish and, as a result, it is a rare occurrence for him to fail to get a limit bag. How did he manage to catch his six fish limit last Saturday when the returns book shows how hard everyone else is finding it? Sinking lines and strange flies may well be the order of the day for him but whatever his tactics they certainly work when most other methods fail miserably. Club member, Martin Brignall (Bottom) is another angler prepared to work hard and persevere despite everything. His last two visits in the past week yielded five fish. Unlike Colin, he fishes more conventional methods and flies, as practiced by the regulars and approved by the Bailiff. While not as consistent as Colin, it just shows that fish can be caught on a variety of methods if you are prepared to work at it. The obvious conclusion is that hard work and perseverance is the key as nothing comes easy at this time of year. Being a naturally lazy person, this sounds too much like hard work to me and I simply content myself just sitting around drinking coffee and doing absolutely nowt, apart from taking the occasional photograph of nothing in particular. Life is hard! 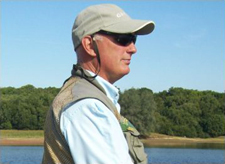 So, what�s the Bailiff doing to encourage those stalwart anglers prepared to struggle on with little or no reward? He�s resorted to carp fishing elsewhere (another secret venue), in between the golf. Now what sort of example is that! 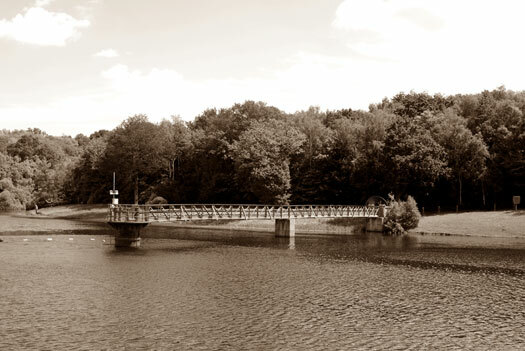 At this time of year stillwaters are not the best places to fish for trout and Powdermill is no exception. However, if you have no choice, Powdermill is as good a place as any. While other smaller waters have had to close, we are still able to offer somewhere for the poor stillwater angler to ply his trade. However, there are many small streams locally which contain a good head of wild browns, but virtually nobody fishes these waters. The fish may be relatively small but the catching of them requires stealth and patience and skills far beyond anything required on an open expanse of water. The photo of this overgrown stream, home to a surprisingly large number of wild browns, is one of those well kept secrets. So much so that I am unable to tell you where it is located for fear that someone may be tempted to violate the total peace and tranquillity of this special place. I have never fished it nor been tempted to do so. It would be a travesty to disturb the inhabitants and to simply be privileged to observe them is sufficient pleasure for anyone. And they say that the camera never lies. For some inexplicable reason I have not taken a photo of the hanging baskets this year. As the blooms are now on the way out I thought that I had better record the fact that, despite the lack of watering, the plants have not only managed to survive but have even flourished. The baskets are not as spectacular as some that you see around, but given that the mean bailiff only puts one (yes 1) plant per basket, and each is only watered when they appear to be on their last legs, it is a reasonable display and distracts the eye from the ageing building. At the beginning of the week we tested the water temperature in various parts of the reservoir. Apart from the very shallow water around the margins where the temperature was 20�C, the entire reservoir at all levels was 18�C. The aeration system is a major factor in mixing any different temperature layers and this gives nowhere for the trout to seek refuge. With the continued warm weather forecast for this weekend the fish will continue to suffer. However it is still possible to catch the odd fish and some anglers are just happy to be around the reservoir enjoying the beautiful and peaceful surroundings. Question: How many people does it take to make the coffee? One woman to make the coffee and two men to issue conflicting instructions! I am delighted to report that Mick Wood has had his knee operation and it seems to have been a great success. His appearance on Friday morning with Joy, his wife/chauffeur, pleased the old boys who frequent the clubhouse most mornings. It looks like he has had a very good start to his period of recovery. However, we were equally pleased to see that his natural pessimistic view of life has not changed and he is still sees life as a series of trials and tribulations... followed by failure! The unsettled weather continues frustrate us. Friday has started fine but with a fairly strong wind blowing onto the dam. A handful of anglers ignored the 'breeze' and decided to fish despite it. All the old boys in the clubhouse finally exhausted the various topics of the day and went home. Another riveting day at the reservoir! Will September prove to be equally exciting? We have recently had the misfortune of witnessing more swimmers taking advantage of the warm weather in between the cold and wet spells. I say misfortune because this year we have had to endure the sight of just males cavorting in the water. What has happened to all those brazen but hardy females who have provided so much pleasure in past years? Should you know of any such ladies please assure them that the bailiff will still rush round just as quickly to admonish them but may well be more sympathetic and attentive. Sympathy is not a word that you can associate with the bailiff when it comes to dealing with the poor unfortunate mice who regularly set up home in the clubhouse. The latest massacre has resulted in four deaths so far, but hopefully the rest of the family have escaped the genocide. What a lot of fuss about a box of chocolates. During March and April a number of anglers were complaining that the fishing at Powdermill was too easy and you could catch your limit in no time at all. Well, for those of you who like life to be hard now is the time to put your money where your mouth is. 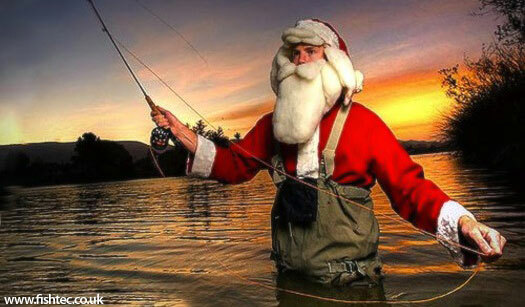 The fishing is never easy at this time of year but if you work hard you can still have a measure of success. The 'bubbles' have been on for the past two weeks and as it takes about this time to get the fish going I expect that this will be THE area to fish during the next few weeks. Earlier this week a fish of 5lb+ was landed. This fish had been in the reservoir for a number of months together with a number of much larger fish which have yet to be landed. However the number of people who claim to have hooked but lost monsters is beyond belief. 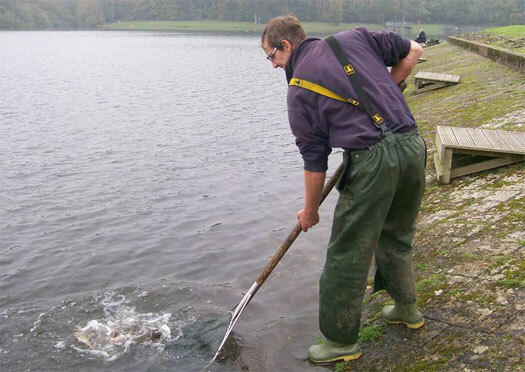 Recently, one unlucky club member even claims that a monster smashed his rod tip with its sheer power before escaping. I am not aware of any other angler having his rod broken by a monster but an unusually large number of anglers have managed to break rods this year by sitting or standing on them; catching them in car door; pulling line through the tip too vigorously; etc. etc. Fortunately our beloved manufacturers are so keen to please these unfortunate anglers that they are only too willing to replace the broken part for free or at a nominal handling charge. Are they simply wonderful philanthropic business men or have they already charged you three times the real value in the first instance? I suspect that we all know the answer. Even I stood on my Orvis rod last season, but it only left a small mark just above the handle. Needless to say early this season a 'power' cast resulted in it shattering at the point of damage. Still, my heroes in Orvis at Tenterden dealt with my disaster with their usual polite efficiency, but did comment that they had never seen one break at this point before. I said nothing! The ultimate disaster is to lose your gear when the 'monster' pulls the unattended rod into the water. This inevitably happens at least once a year at Powdermill. 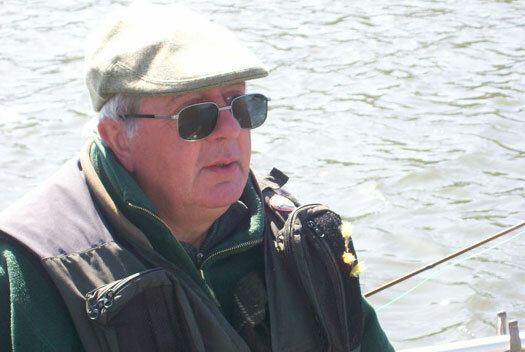 This year the honour has gone to Mr Pilcher who also managed to break his other rod during the same boat session. As they were both expensive Enigma rods he was not a happy man. His broken rod was replaced but, unfortunately, manufacturers are unwilling to replace lost rods! I have learned that one of the benefits of using lightweight Airflo reels is that they are not heavy enough to sink the rod so when the unattended rod disappears over the side you can chase it around the reservoir (as long as you are in a boat of course). My boat partner was rowing while I shouted directions and after about fifteen minutes of frantic rowing we finally recovered it and landed the culprit. This was a couple of seasons ago and he has not fished since. Was it something I said? As you will gather, apart from the 5lb+ fish, nothing exciting is occurring at this time of year. The reservoir is a picture of peace and tranquillity with few anglers to irritate you by insisting on sitting next to you on the dam or crowding you when you find the hotspot when boat fishing. So ignore the "I want to catch my limit" brigade and come and enjoy some thinking man's sport for a change. PS. Thanks to Bill Payne for generously donating his old camera body. This will help reduce the number of lens changes I have to make, only to be too late and miss the perfect 'shot'. I am looking forward to him updating his Nikon D5100. 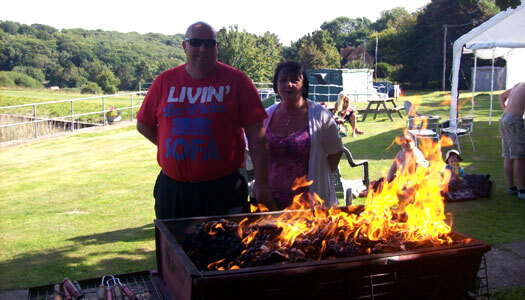 Click Here to view the photos of the Annual Club Competition and BBQ 2012. Friday 17th August proved to be the perfect day for this annual event. The weather remained perfect all day and the fishing was reasonably challenging with the 28 anglers managing to catch a total of 34 trout and a few perch. 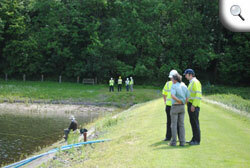 Sadly, eight anglers failed to catch fish. Surprisingly, only 12 fish were caught from boats while 22 were caught from the bank. 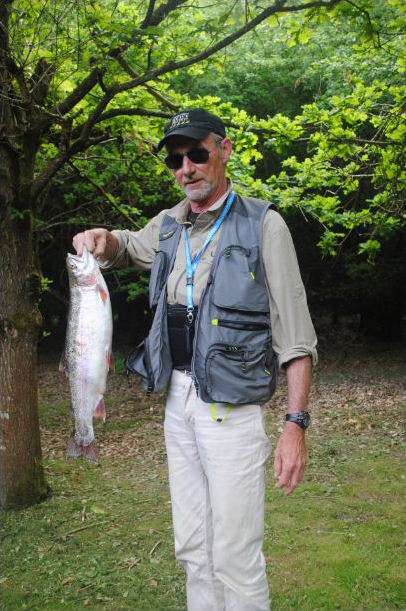 John Noble, one of the favourites to win, got off to a flying start with three fish from a boat in the morning session and then managed to add another from the dam in the afternoon. Martin Brignall, another good bet, failed to catch anything from a boat in the morning but managed three from the dam in the afternoon. 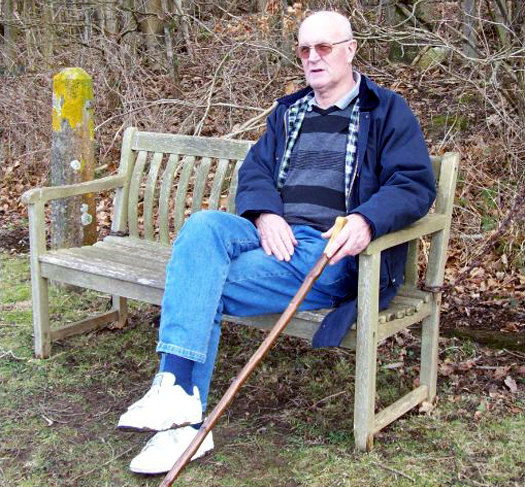 Having caught three fish from the bank in the morning, Paul Strivens fell by the wayside having then failed to catch anything in the afternoon. 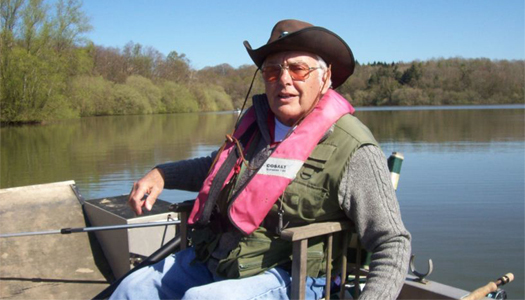 The only other angler to catch three fish was another pre-match favourite, John Austin, who had one from a boat followed by two from the dam in the afternoon. The evening BBQ was a resounding success with a vast array of raffle prizes including a large amount of whiskey, other spirits and an assortment of other super prizes (over 50 in total) including a nights stay for two at an exclusive hotel in Le Touquet won by a delighted Mary Stacey who also managed to win the giant basket of fruit. The superb high quality fishing waistcoat and life preserver was won by an equally delighted Alec Chisholm. A special thanks goes to Patric (yes that is how it is spelled) for his generous donations. Mandy and John Chapman managed the BBQ as usual and succeeded yet again in feeding everyone without any evidence of food poisoning. You can also go to our Facebook Page for all the photos. 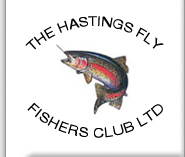 John Noble was the winner of the Hastings Fly Fishers Annual Club Competition but the real winners were all those who took part and/or attended the evening BBQ. An enjoyable day was had by all. Report and photos to follow once we have sorted through the 500 photographs. A long weekend in the New Forest would not be complete for me without a brief visit to Fordingbridge where on the Avon opposite the George Inn I caught my first rainbow trout on a fly. Sitting by the river in the George and watching the trout negotiate the strong currents swirling down from under the road-bridge brings back many happy memories. Conversely, it is only in recent years that I have discovered the beauty of the Oakley stream which is part of the river Test. A visit to the National Trust's Mottisfont Abbey gives you the opportunity to experience the magic of a small part of the Oakley stream which visitors pass by on the way to the Abbey gardens. The number of visitors who cross the bridge from the car park into the gardens without bothering to look into the water always astounds me. If they just paused for a moment they would be regaled with an array of rainbows, browns and even grayling on both sides of the bridge and some of the trout are very big indeed! For those of you who have not had the sheer delight of ambling along the banks I reproduce the 'official' blurb. The Mottisfont Abbey Estate has three magnificent beats on the River Test and a delightful stretch of the River Dun which joins the Test at Mottisfont village. 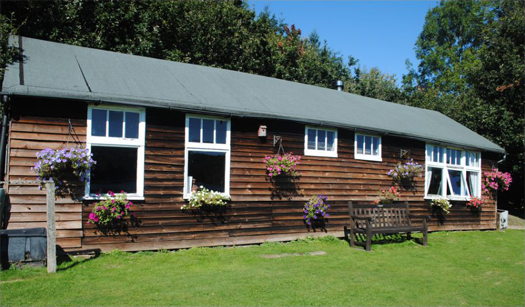 All four beats are managed by the National Trust and the Mottisfont Fly Fishing Club with the goal of providing the highest quality chalk stream fishing in a natural setting on the most historic dry fly water. The River Test sweeps in stately fashion down The Main beat, whilst the Rectory is as pretty a piece of fishing as you will find anywhere in the world. But hold your breath for the Oakley Stream, a part of the living history of dry fly fishing and every bit as magical today as it was when F W Halford held court to his Victorian dry fly disciples. Oakley Stream The spiritual home of English fly fishing with the famous thatched Oakley Hut built for Halford himself. Long, fast deep beat for the first half, with a slightly slower, deeper second half. Double bank the whole way, with sections where you may switch banks. Rectory Not dissimilar to Oakley, though is does have the chicane bend where the water flows just about faster than anywhere else on the Test. Often holds very, very big fish at the junction with Wallace�s Ditch. As ever double bank, but the fishing confined to just the one bank on some parts of the beat. Lovely hut at the beat mid-point. The Main Majestic, wide section of the River Test, so wide it takes a good cast to reach the midpoint. Single bank fishing from the left side as you look upstream, so not a recommended beat for a left hander. The rotunda oak and thatch cabin is quite the place to dawdle away the day. The Dun Exquisite meandering stretch of riffles and pools through water meadows above the hut and below it, a quiet glide through woodland to a spectacular weir pool at the bottom. A good beat for holding fish that rise freely in the parts that are shaded by woods on either bank. Visitors can walk along the stream running through the gardens but the vast majority of the water is not open to the general public as it is some very expensive fishing, but there are ways and means if you know or meet the right people. 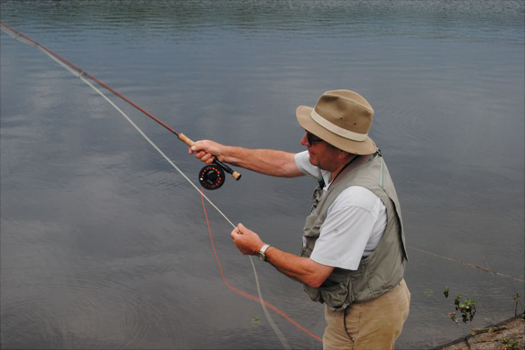 The cost per rod varies dramatically, up to �575 per rod with a minimum booking of two rods. But at this time of year it's only �195 per rod, so if someone needs a companion, I can be ready to go at a moment�s notice. But hang on; I don't think my 8 weight rods and lines are quite the ticket for this type of water! 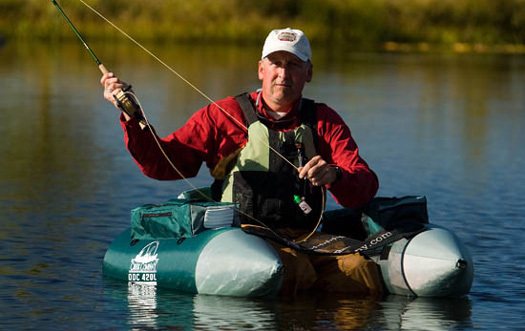 FLOAT TUBERS - THE FLY FISHING LEPERS? Sadly, earlier today I had to refuse a polite email request for Powdermill reservoir to host a float tube demo day. Unfortunately, there are so many reasons why many potential venues are obliged to decline such advances and those of you who subscribe to the various monthly fly fishing magazines will have read all the arguments. As it happens, our members have discussed the question of allowing float tubing in the recent past but there was no support for allowing it. Just because our members do not want to participate in such antics, it should not preclude the Club from testing the water so to speak on the pretext that 'How do you know if you haven't tried it?'. I suggest that we start by adding this discipline to Club competitions. After all, our annual club competition requires participants to spend half a day on the bank and the other half in a boat. You would be surprised at how many members of Hastings Fly Fishers are averse to taking to the water in what they see as somewhat flimsy and unstable vessels. Now, adding a third discipline to the days activities seems to me to be a reasonable challenge for everyone. With the average age of club members estimated to be well over 70 the float tube session would be an exciting addition to an otherwise boring day for the spectators. Despite the overwhelming feeling that float tubing is not for us, I can see some positive advantages. Given that the majority of ageing club members are somewhat incontinent, I am sure that members would appreciate being able to relieve themselves in the water without drawing attention to themselves or having to row in. Perhaps I should have suggested that the float tube lepers should approach Bewl where they could join in with the 'any method' rabble and enjoy the added excitement of avoiding the sailing boats and wind surfers. Before you tell me that Bewl water is too large for float tubers, may I point out that you can get models where you can attach an outboard motor. So come on chaps, someone give them a try.... but not in my backyard! We currently have 22 entrants for the Club competition which takes place on Friday 17 August. The usual format will apply with half the anglers fishing from the bank in the morning while the other half take to the boats. They will than switch over in the afternoon. There will be a 3 fish limit in the morning to ensure that everyone has to fish in the afternoon. Last year was the only occasion that the competition was won with less than a six-fish limit and we are hoping that this was simply a blip in the quality of fishing that we expect on such occasions. The BBQ will take place at the end of the competition and all members together with their guests are most welcome. This recipe sounds a little strange but just try it for yourself. 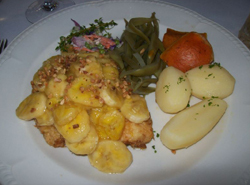 Its called Banana Trout! Click here to read this great recipe. With mayflies still making an appearance, albeit in small numbers, there is still plenty of opportunity to see the elusive Hobby performing some amazing acrobatics as one or more of these beautiful birds hunt down the unfortunate mayfly. We are now well into the second half of June, yet dry fly tactics are still proving successful and the favourite method for most regulars. I promised not to mention that yesterday, halfway through a morning dry fly session, Mick Wood decided to return to the lodge for a reviving coffee. He had missed a number of takes and even managed to hook one but still lost it! 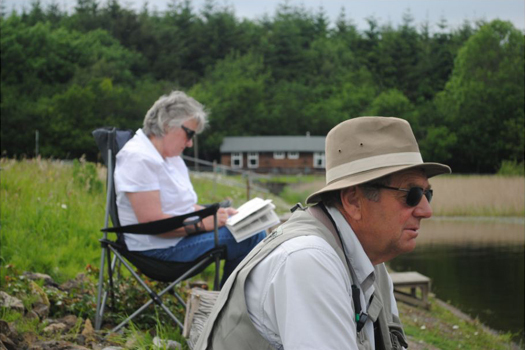 We watched from the comfort of the lodge as the bailiff sauntered along the dam, having been to see how the other bank anglers were faring. He spotted Mick's unattended rod, decided to have a cast to see how the rod performed and promptly caught a fish first cast. Having decided that this Orvis rod was too stiff and unresponsive he promptly put it down and continued on his way! The showers are not causing too many problems for anglers but the forecast of strong winds for the weekend will upset many. Hopefully the weather experts will have got this wrong, as a bit of settled weather would be much appreciated. However, there are some encouraging factors. Water temperatures are still relatively cool for this time of year, there is no sign of water levels dropping, clarity is excellent and the 'bubbles' continue to work, so the reservoir is in pretty good shape. Indeed, water conditions are so good that I predict that the competition with Eastbourne Fly Dressers Guild on Saturday 30 June will produce more fish than the record of 45 caught in 2008. Those of you who have fished from the dam in recent weeks will be well aware of the amount of plant life growing in between the blocks that make up the actual face of the dam. Lines get tangled up in the weeds which can become very irritating. However, the real problem is that the blocks could eventually be dislodged by the more substantial root structures. 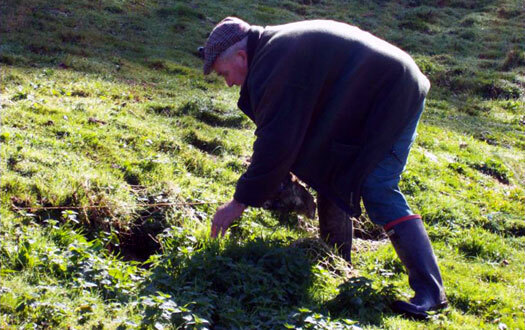 For the past few years attempts to control the problem has involved strimming as chemical solutions do not normally go down well when drinking water is involved. 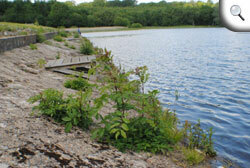 The major concern is the proliferation of ash trees that are taking hold all along the dam. Strimming them just makes for stronger regrowth. Today, we were entertained by a meeting of interested parties from Southern Water and their contractors (six men in six vehicles) who had assembled to witness a demonstration/trial of a 'green' solution. This involves using a tractor to pump/spray a pre-heated substance which becomes foamy and clings to the plants. This hopefully will eradicate the weeds without killing half the population of Hastings and the surrounding area. Cynics do not believe that any 'safe' solution could possibly be lethal enough to kill the Ash trees, some of which are quite large and bushy as can be seen from the photo. 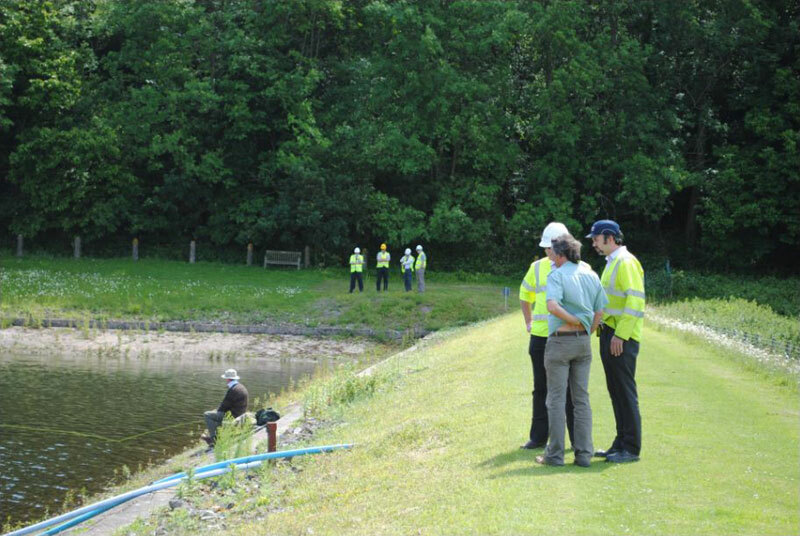 We were particularly pleased to see that the delegates all wore fluorescent jackets and hard hats during the festivities, but where somewhat alarmed to note that the anglers along the dam were not equally suitably attired and were therefore in danger from extraneous object randomly falling from the sky or not being clearly visible should a vehicle run amuck along the dam. We look forward to the delegation returning to view the results of the trial, as only a very small area was treated and the remainder of the dam continues to 'return to nature'. In the past few days a number of Hobbys have been observed hunting mayflies and presumably other flying creatures. At one point there were four working the reservoir at the same time. It just goes to prove that there are still mayfly about and in recent days more fish have been taken on dries than during the peak of the mayfly hatch. Its a case of fewer flies means more chance of the imitation being taken. Catherine Barnes, our favourite professional photographer, was away photographing a wedding on the day that her partner, Andy decided to see what he could do without her. As usual he was motored around the reservoir by his fly fishing guru, Keith Blundell. Sorry Catherine, but he seems to have exceeded even your high standards with his latest efforts and his photos of the elusive Hobby are genuinely outstanding. I don't think that we could get much better photos than these as these birds are so fast that getting a really good shot is almost impossible. On Tuesday an afternoon / evening challenge match took place between Club members living in Kent and Sussex. 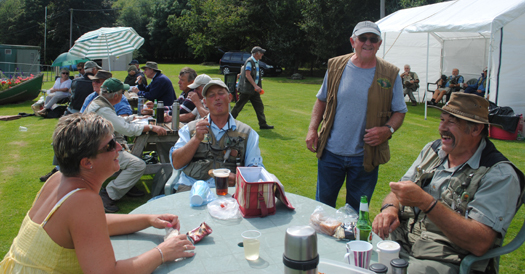 Each team consisted of eight anglers captained by Don Burt (Kent) and Alec Chisholm (Sussex). Unfortunately, they could hardly have picked a worse day as a strong wind blew onto the dam, making casting very difficult and conditions cold and uncomfortable. As a result of the miserable conditions, the sixteen anglers only managed eight fish between them with only Martin Brignall managing to catch two, six others catching one each and nine blanking. Both teams managed four fish each, but Kent just scraped the win by a mere 10ozs. Martin Brignall (Kent) won heaviest bag with his two fish while Don Burt had the heaviest fish and therefore took second place. The other money winner was John Noble (Sussex) who just scraped into third place. There is something about HFFC competitions which guarantees a lack of fish combined with pain and suffering. The next guaranteed spot of wretchedness will take place on Saturday 30 June when Club members take on the Eastbourne Fly Dressers Guild for an entire day of abject misery. However, the weather invariably improves for the early evening BBQ and prize giving, so everyone eventually goes home happy, vowing to return the following year! Just to remind everyone that this will take place on Friday 17 August. Raffle prizes would be greatly appreciated. So you think that we have had plenty of rain at the reservoir recently; well, don't come to me for sympathy. Having been up and down the entire length of the M4, in the past few days, in conditions that my windscreen wipers were unable to effectively cope with, not to mention the wind, I am thankful to return to the sunny South East in one piece! As a result of my absence I have to rely on others to provide a picture of what's happening. 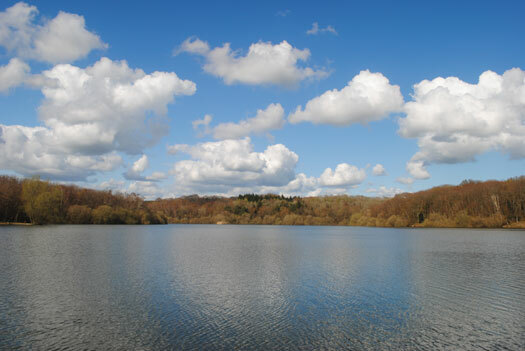 "Having not visited the reservoir recently, I went to the lake yesterday for a few hours of perfect may fly fishing. I arrived at 7.30am and left at 11.30. I appreciate 7.30am is not your day time but it was perfect. I took a boat and the fish were taking may fly which weren't in abundance but enough to keep them interested. I had caught a fish and lost 3 before I saw anyone! I am leaving my desk and going back today for more." This is arguably the best time to fish a dry fly when the fish are still very interested but the number of flies on the water are limited so the fish are not so selective. As for perfect peace, there are always opportunities to fish in semi-isolation as we only have 12 boats on 55 acres of water which means that boat space is never at a premium. Even bank anglers can experience complete isolation by walking around to the three 'cut-outs' in the woods where you can fish all on your own. I could do with some 'perfect peace' after the mayhem of the M4. In between the showers the fishing is excellent. The advice to seek out the fish rather than just sit and wait for something to happen in front of you still holds good. This morning, the bailiff demonstrated the art of seeking out a fish and casting a dry to it to elicit a rise. While looking out of the window of the lodge with my cup of coffee, I watched him prowl along the dam looking for signs of fish and before I had emptied my cup he had landed two fish. Even Barry 'the fishmonger' doing the opposite - sat on a wooden platform like a little gnome - also managed to catch one during my short coffee break. So did I rush out to join them, or at least take a few more boring photos of yet more people holding fish? Sadly not as I promptly left having not brought my fishing gear or camera. The weather forecasters had predicted all manner of mayhem and as usual I was not prepared to suffer. Fortunately for them, by 5pm the heavens opened proving them right (just thr timing was wrong!) but by that time any sensible angler would have been long gone. 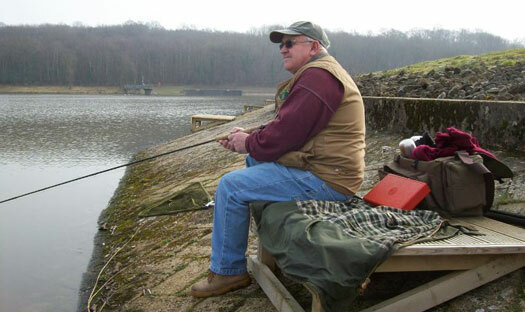 Tim Heasman and his fishing pal Andy are regular visitors to the reservoir. Unlike most anglers, Tim invariably carries a camera or two with him and when the opportunity arises, being an accomplished photographer, can spring into action and take some spectacular images. 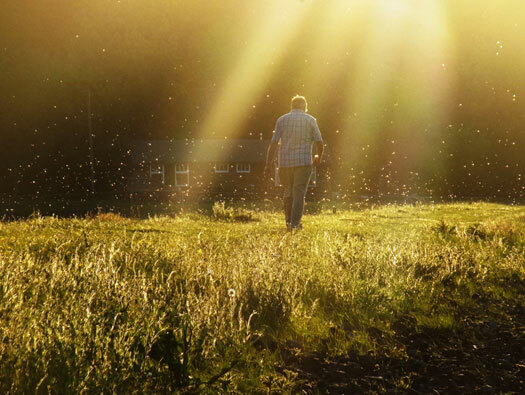 His recent photo of Barry 'the fishmonger' Morgan strolling back along the dam towards the clubhouse surrounded by swarms of mayfly, with rays of sunshine breaking through the clouds, was so good that the print he gave to the bailiff was immediately snaffled by 'the fishmonger'. If we ask him nicely he may provide another one to frame and put up in the lodge. To view all the amazing photos that Tim Heasman has taken at Powdermill Reservoir, visit his Flickr page by Clicking Here, you will not be disappointed. You can also find the links on our Facebook page. The weather continues to keep us guessing and there seems no end to the uncertainty. As I write this the reservoir is bathed in sunshine but at times it can become overcast and showers are forecast for this afternoon. The only good news is that as a result of the drop in temperature the water has cooled which will please the trout. Mayfly are still in evidence but its best to look for rising fish rather than sit tight. Fishing as close as possible to the overhanging foliage is proving to be very productive as, in addition to creatures emerging from the depths, there are plenty of others falling from the branches. 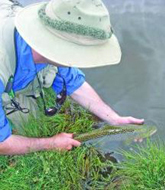 The sequence of photos shows Don Burt casting a dry close to the trees and hooking a small resident brown. A very unsettled start to the holiday weekend has already disrupted some Royal celebrations and it has not made life easy for the fly fishers at Powdermill taking a break from the festivities. In between the showers and the cool breezes there has still been some pleasant and productive fishing. However, like the majority of us, the mayfly love the warm sunshine and still conditions. So there are still many mayflies due to emerge and fair-weather fishermen like me can only hope for some settled conditions to enable us to enjoy the remainder of the hatch. The other evening my camera caught the bailiff looking longingly for a sign of fish rising before it became too dark to fish. Sadly this was one of those evenings when the fish ignored the mayfly returning to the water and, as darkness fell, we bemoaned the uncertainty of second guessing the vagaries of both fish and fly. In order to ensure that we have sufficient fish to take advantage of the continued fly hatch, we received a double shipment of 2lb - 2�lb rainbows earlier this week. These fish had exceptionally good finnage and appeared to have travelled exceptionally well. They should be in perfect condition to give you plenty of good sport over the holiday weekend. Don't forget that there are 'monsters' from earlier stockings which are still to make an appearance and someone has to beat the French. It could be you! I was fortunate to be lounging around the clubhouse in the afternoon waiting for the evening rise, which never materialised, when one of our regular French visitors entered with the largest fish to be caught so far this season. This 6lb 10oz beauty is another of the smaller sized 'large' fish that we have stocked. Unfortunately, like the majority of you, his name in the returns book only consists of his surname and anyway is illegible. I look forward to his e-mail as I know that he looks at our website. This situation gives me the opportunity to insult you all by pointing out that even in third world countries people can write their names. Just take a moment to look in the returns book and you will see that the majority of your entries highlight the abysmal failure of our education system. I am reassured to see that the French are no better! So how did I do that evening. Well, there were loads of flies on the water and the odd fish was rising but not in sufficient numbers for me to try a dry. So I started with a Pheasant Tail Nymph but got snapped by fish number four and, not having another PTN, to my eternal shame reverted to my favourite fly for the other three fish. I can only apologise yet again to the bailiff for my choice of fly as I know that it makes him feel that he has failed yet again in educating me in the 'proper' way to fish. So, just another failure in the system of education? Certainly not, just a temporary lapse. At least I was able to clearly write my name in the returns book. I am told that mayflies, sedges and all manner of flying creatures swarmed over the reservoir on Monday but rising trout were difficult to find. However, the bailiff spotted a shoal of beautiful rudd feeding by the rushes alongside the dam and had some super sport catching them on dries. On my arrival on Tuesday morning I was entertained by clouds of mayfly doing their courting dance in front of the fishing lodge. Sadly, I was unable to join the lucky anglers who were blessed with a very light breeze and an equally gentle ripple. 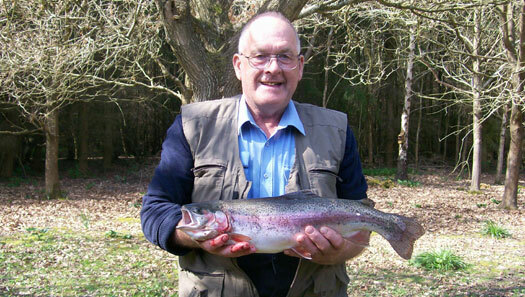 A very large delivery of rainbows is arriving on Wednesday from Bibury fish Farm. This is our only consignment from them this year and it will be interesting to see if their fish behave any differently from those of our other two suppliers. Last Tuesday evening saw the most spectacular mayfly hatch in years. Chris Richards took a couple of photos of this amazing event using the camera facility on his phone and you can see them on our Facebook page. Flies seem to be emerging steadily, but in small numbers throughout the heat of the day, dancing in groups on the bank-side and then returning to the water en-mass in the evening. On Tuesday evening you could not fail to catch your limit on dries as the fish went crazy for the returning mayfly. The bailiff landed six fish in twelve casts. Having got stuffed full of mayfly, they are now proving to be more discerning. By Thursday evening, your intrepid reporter decided that they were now difficult enough for him to give you a first-hand account on how to really fish a dry. My excellent mayfly imitation (not tied by me) could be seen floating within two inches of the real thing, only for a discerning trout to rise and gently sip in the real fly, leaving my offering unmolested. Fortunately everyone on the dam that evening, including the bailiff, failed to catch on a dry thus saving my embarrassment. However, before you feel sorry for me, I should point out that my favoured fly is the notorious "Orange Fritz", much despised by the bailiff and his fellow 'purists', so you will appreciate that what I actually know about fishing dries is somewhat limited! It looks like the mayflies will be with us for some time so it's now just a case of being in the right location on the reservoir at the right time to either find them emerging or returning in sufficient numbers to stimulate the fish. The key factor from now on will be the force and direction of the wind. Don't forget that we only have a few boats so booking in advance is strongly advisable to avoid disappointment. Phone between 9.30 and 10.30am to book your boat. The following article is taken verbatim from The Nashville Gazette as reported by one of the King of Country's flunkies, who is part of the entourage accompanying him on his current tour of Europe. Whilst in the UK, the 'King of Country' took the opportunity to visit his favourite British fishing haunt near Hastings in East Sussex. Unfortunately, he was hunted and harassed by a team of "High Speed Paparazzi", trailing him around the lake. The two Paparazzi made no secret of their presence, they could be heard plotting from one end of the reservoir to the other. Some may in fact call this incessant chatter. which gradually fouled the propeller. Unfortunately for them, it required them to grovel to their prey for a tow back to port. Apparently salvage rights are still being discussed. Once ashore, peace reigned throughout the water, the only sound to be heard was that of the continuous hatching of MAY FLY beating their wings. We do not apologise for showing you even more pictures of fish arriving at Powdermill. Among the normal 2lb fish, this shipment included the largest specimens stocked this year. With the improvement in the weather and the promise that the wind will ease off we are set for a comfortable, enjoyable, and hopefully productive few days before the next double shipment arrives next week to further boost stocks. We are currently stocking very heavily in order to maximise everyone's chances of catching feeding trout using Mayflies. We have provided the fish, the reservoir is producing the fly life; the rest is now up to you. 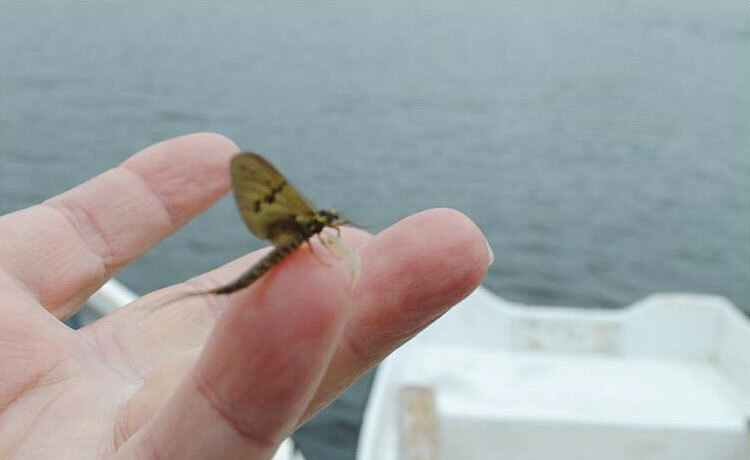 The mayfly hatch is now well underway with flies emerging all over the reservoir. Despite the consistent hatch we have still not reached the peak when mayfly can be seen swarming everywhere. However, fish are now appearing to be more preoccupied with the mayfly and fish that have been spooned are reported to be full of mayfly. The weather forecasters keep changing their minds and are now suggesting that the weather is going to improve - warmer and less windy. I wish they would make up their minds. The problem at the moment is the wind coming from the north and blowing onto the dam. We are assured that the wind will abate as the week progresses so conditions should become ideal for dry fly tactics, even off the dam. On the basis of the hatch so far, our prediction is that the mayfly will now continue to emerge well into June and fish will become even more fixated with emerging flies to almost the exclusion of anything else. So from now on there is no excuse for using any other method. For those who have not had the opportunity to fish during a mayfly hatch, we can assure you that there is no more exciting way of catching trout. At this stage of the mayfly hatch you need to move about to find the brief flurry of activity which constitutes an intermittent hatch with fish rising. 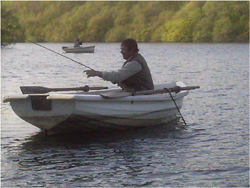 Although flies are emerging in very small numbers all around the reservoir it is more productive if you use a boat to seek out rising fish rather than stay on the bank and hope they come to you. Boats are limited (we only have a total of 13) so you really should book one rather than just turn up and hope for the best. On most days you can turn up and get a boat but sods law means that, on your particular day, everyone had decided to join you but got there first. Despite the miserably erratic weather we have already had two days when all boats were taken and this situation will become more fraught when the hatch becomes frenetic. So book your boat one or two days before you plan to fish to avoid disappointment. Don't forget that you should phone between 9.30 and 10.30am to book your boat. Call (01424) 870498. You may remember that back at the end of March 2011 we were obliged to deny meeting the 'King of Country' after rumours began to circulate among club members that a celebrity had visited us. We were once again unable to announce his impending arrival before the event in order to maintain his privacy. Suffice it to say that we understand that this time he brought his youngest son with him in the hope of coinciding this visit with our mayfly hatch. Our 'celebrity' graciously allowed me to take a limited number of candid shots before I was obliged to leave him to enjoy his fishing in peace. Maybe next time he may be persuaded to bring Dolly with him. We were treated to Powdermill's version of a booze cruise when some 'anglers' decided to party in the middle of the reservoir. With plenty of alcohol and cigars in evidence, but sadly no scantily clad ladies (or females of any description for that matter), they set about showing the miserable sods in the other boats how to enjoy life despite the changeable weather and mid-day drizzle. I thought that they had caught fish as they had bags over the sides but they turned out to be booze keeping cold. The revellers apparently had some connection with Tate Fencing (a very reputable firm who deal in all things timber) whose Directors would be horrified if you were to contact them to complain at www.tate-fencing.co.uk. Did they catch any fish?... Who cares! Do I get a discount for this free advertising? I doubt it, they didn't even offer us one of their many bottles. TELL IT AS IT IS! The cold weather must be a factor in limiting the number of mayflies emerging from the cool water. However, they continue to appear at a steady rate and fish continue to take them off the surface, but we have yet to see the first mass exodus. Although anglers are catching fish on dries every day, others are still opting for different methods. At some point the temperature must rise (after all it is now the middle of May) and then hopefully we will be treated to some fabulous dry fly fishing. However, the 'experts' at the Met Office are now predicting much of the same for the second half of the month and even into early June. So the least I can do is publish a photo taken this afternoon of two boat anglers sensibly attired for the prevailing weather conditions together with a photo of a mayfly which landed on my finger minutes after, presumably attracted by the warmth of my hand. 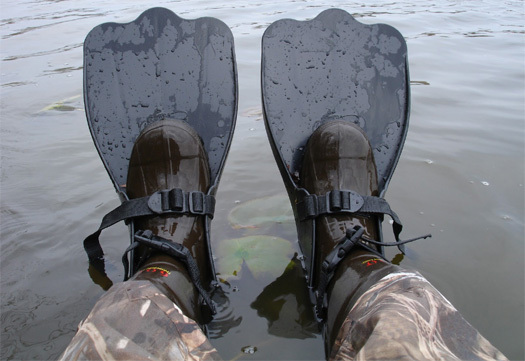 With the uncertainty over the mayfly hatch this year anglers are desperate for the very latest information. We only just recently announced that a new record had been set on Saturday 5 May when we had 235 individual visitors to the website with 53 returning again on that day. Well, on Tuesday 15 May we smashed this record to smithereens with an amazing 318 visitors with 77 of these returning on the same day. On this basis, more of you need to subscribe to our occasional newsletter (we currently have 342 subscribers) and our Facebook page to ensure that you get the very latest news hot off the press. 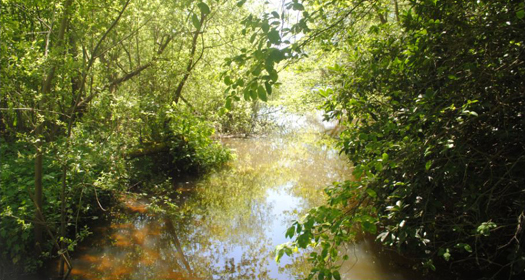 Thank you all for taking an interest in what is happening at Powdermill and we hope that you will find the time to visit our beautiful water. The magical beauty of this wonderful water cannot be dispelled by the regular showers (some heavy) which plague us at present. The reservoir is a real gem at this time of year with most trees now well in leaf and creatures of all kinds in evidence. Even if the fishing is slow, you only need to look around you to appreciate and enjoy such a beautiful setting. Club Members who have not ventured elsewhere will not have seen a blue trout as we have not bothered to stock them in the past. One of our suppliers included forty in their last delivery and so far eight have been caught. The blue colour does vary in intensity and the example photographed, caught by Chas Hards, is one of the more silvery blues. I always enjoy a bite in the boat, but I have noticed the increased tendency for boat anglers to come ashore to enjoy a spot of lunch. Our French and Belgian friends who regularly make the long journey across the Channel can be forgiven for taking time off during their long day to partake in a civilised luncheon complete with beer and wine. So its good to see some of us Brits taking a leaf out of their book and indulging in a bit of fine dining. By lunchtime this trio had only managed one fish between them but made up for the slow sport with a leisurely gastronomic repast worthy of our Continental cousins. How many more fish did they catch? I have no idea, as I left to go home for my lunch. Last year Catherine was fortunate to be able to photograph a Hobby in action catching mayflies over the reservoir. 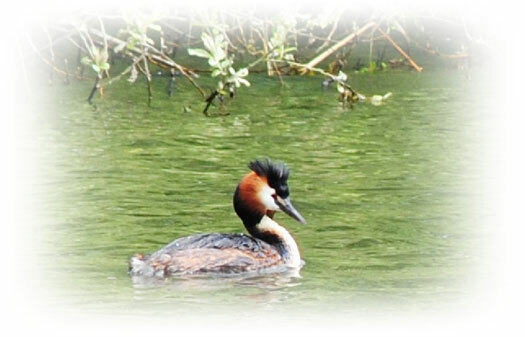 However, my favourites from last year were the two photos of the beautiful crested grebe. This year we are delighted to be able to show another small selection of Catherine's photos taken at the reservoir on Saturday 12 May. Once upon a time there was a row of marker buoys parallel with the dam which boats were not allowed to go inside. Over time the ropes rotted and for the last couple of years the markers have been absent. The lack of markers has meant that many boat anglers have ventured too close to anglers on the dam and have even been blown onto it causing damage to the boats and serious risk to themselves. In an effort to reinstate some semblance of order we have placed new marker buoys in what has turned out to be the worst straight line I have ever seen. Heaven forbid that I should also suggest that they are also too far out, but suffice to say that by the time the third buoy was in place I could hardly hold the camera I was laughing so much. Don't take my word for it, come and see for yourselves. The fishing statistics for April have now been updated (nearly). Visit the Fishing Statistics page for more information. Mayfly fever is reaching new heights as anglers prepare for what hopefully will be an exciting hatch. Despite the awful unseasonal weather, anglers keen to find out the latest information are accessing our little website in record numbers. 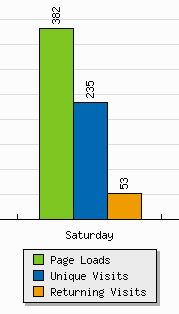 On Saturday 5th May we had 235 individual visitors to the website and 53 even came back again, presumably because they could not believe the nonsense they read the first time! Given that we only have a few visitors to the reservoir each day, I have to ask myself "Who on earth are you all?" The continued cold weather is putting pressure on our stock of seasoned timber as the log burner continues to earn its keep despite it now being May. Although we are avoiding many of the showers forecast, there is still a chill in the air and anglers are only too keen to take a break from fishing to get warm. As a result, the sawing continues apace. However, this is not the important news of the moment! On Thursday the bailiff and his son, Lee, decided to have a few casts by the outflow. Fishing buzzers they each caught a couple of fish including a blue trout caught by Vic - the first of the forty. Vic then saw a fish rise in front of him so they both immediately put on a dry mayfly. Vic�s first cast immediately elicited a take and he began to play the fish only to see Lee�s fly disappear as another rainbow rose. The battle was on to land the first fish caught on a dry. In a panic, Vic admits to having to unceremoniously bully the poor fish to the bank, in a win or bust effort to maintain his reputation. On landing their fish they both promptly packed up, happy to have experienced once again the thrill of what makes Powdermill so special. we can officially confirm the start of the 2012 dry fly period. You can always rely on some smart-alec to be quick to correct you if you make a slip. Well, I believe that Marc Thain is quite correct in admonishing me in this instance. I incorrectly identified the orchids I photographed as being the common orchid. 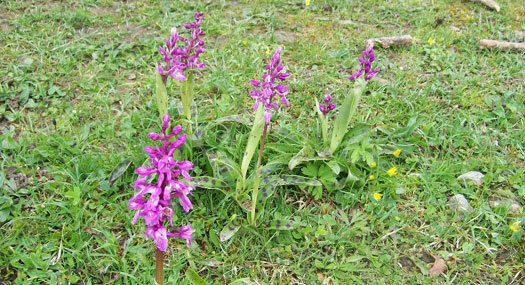 These are in fact the Early Purple Orchid (Orchis Mascula) and not the Common Orchid (Dactylorhiza fuchsii) which does not flower until June. To my inexpert eye they look identical, especially as the colour of individuals varies so significantly, but the flowering period should have alerted me to my error. Mae culpa! Some anglers look forward to seeing the beautiful Common Spotted Orchid (Dactylorhiza fuchsii) on the grassy east bank of the reservoir. 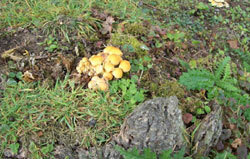 The photo shows a small cluster on the grassy bank between the outflow and the walkway to the tower. There is even a lovely example beside the path in the bailiff's front garden. However I was disappointed to note that there appear to be fewer examples in evidence around the reservoir this year. 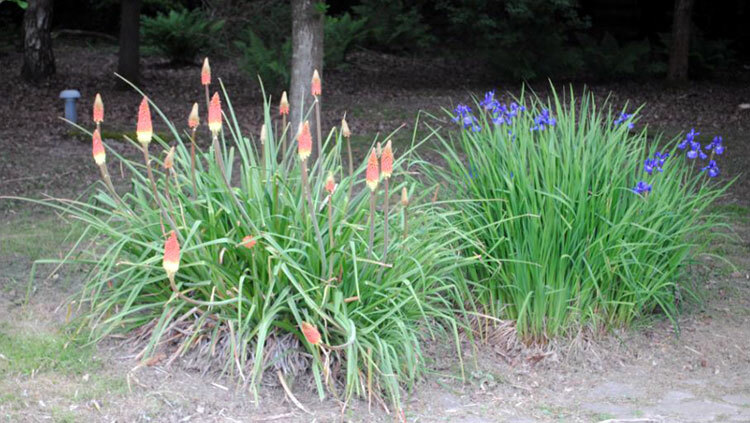 So if you see one of these plants please leave it alone and just enjoy it. Another seasonal pleasure to enjoy are the carpets of bluebells which are at their best now. 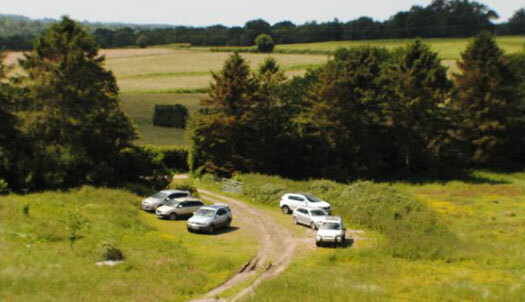 On the way from the reservoir to Sedlescombe, at the junction of Brede Lane and Reservoir lane (previously called Powdermill Lane), you are faced with Little Brede Wood. To me this is the perfect example of a small English bluebell wood. Long may it remain in its present state. LAST DELIVERY BEFORE THE HATCH STARTS IN EARNEST? The latest fish delivery has just arrived in time to coincide with the first sighting of a small mayfly hatch. On Wednesday, Club member Ron Dove saw a number of mayfly emerging from the water around the willow tree on the west bank. However, there were no signs of any fish taking them and it's not until the mayfly start to appear in greater numbers that we can expect dry fly fishing to be a viable method. 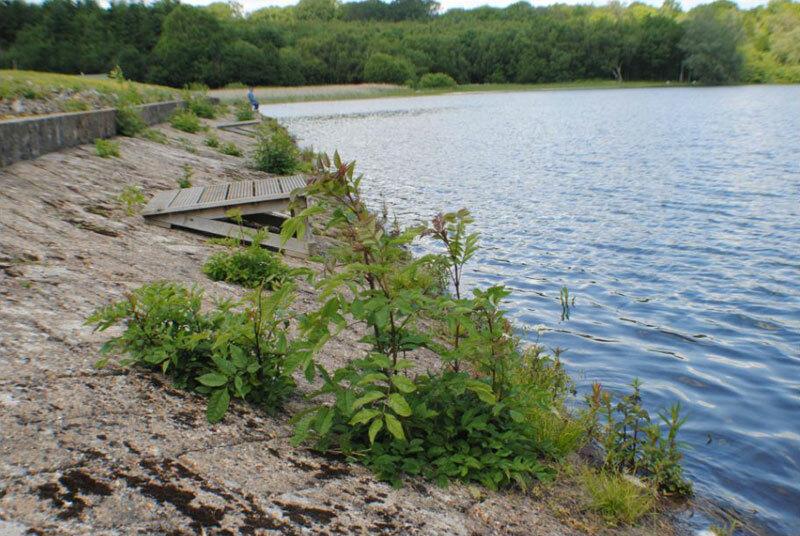 At the same time, a number of visitors also spotted the odd mayfly in various locations around the reservoir and one angler claimed to have put on a dry to illicit a rise, but missed it. From now on we can expect many tales of near misses, monster fish being hooked and lost, and other tall tales, as 'May madness' takes hold! To be fair, one should not discount any tale of big fish escaping as today's delivery contained eight large super rainbows from our supplier's specimen pool. These have been specifically ordered to hopefully provide some lucky anglers with a heart stopping experience should they tempt one of these specimens to rise to a dry fly. In addition to the normal rainbows, this shipment contained forty blue trout which are reputed to fight harder than ordinary rainbows. However, there is no evidence that there is any difference apart from the colour. As they were put into the reservoir we had no real opportunity to examine these fish closely but we did note that they vary significantly in the intensity of the blue. The sun keeps breaking through the clouds and providing anglers with some comfortable and enjoyable fishing. 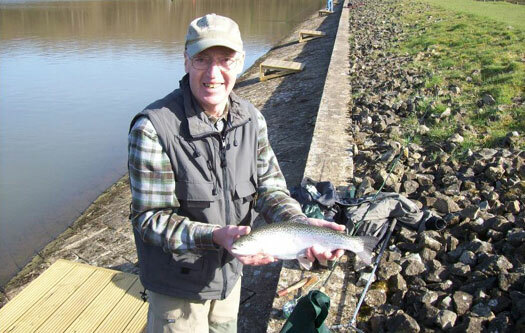 Club member, Arthur Macey, can be seen here landing another hard fighting rainbow in between the showers. The forecast is for much of the same, which could be tricky if the mayfly start to hatch in any numbers. Quite a few anglers have now claimed to have seen the odd mayfly. However, they are few and far between so we are not prepared to announce the real start of a hatch, but now is the time to get prepared. Unlike previous years, the bailiff does not have a stock of mayflies to sell so you must bring some of your favourite patterns with you. If you haven't done so yet, make a point of subscribing to our email newsletter in order to be one of the first to hear what's happening at the reservoir. Strolling along the dam this morning in the pleasant sunshine one could see a few of the residents, who live among the rocks, bathing in the warm sunshine. 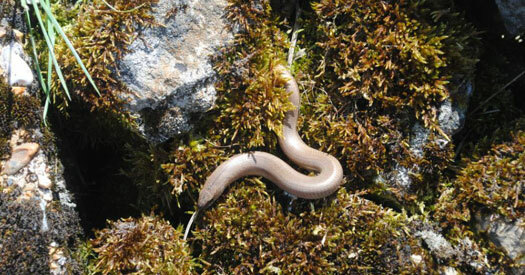 The slow worms are happy to just sit there and rely on inactivity to avoid being seen. However, the resident common lizards, who tend to disappear very quickly when they spot you coming, were nowhere to be seen. One can only assume that the passing anglers had disturbed them. I decided to photographed this male slow worm as he was unusually pale compared to the majority found around the reservoir. Due to a number of complaints concerning recent comments made in 'Latest News' apropos our latest acquisition, we will let the photos speak for themselves. Sufficient to say that, more by luck than judgement, no one has actually died as a result of consuming the results of these activities which are surprisingly tasty. Rumour has it that our next venture will be to set up an illicit still in the woods. Having grown to appreciate the benefits of a log fire in the lodge, it is not surprising that original sceptics are now only too keen to replenish dwindling stocks of firewood, even if some of it is just a load of old fence posts. For the longer term we are now building up stocks of logs as we have enough timber available on site to keep us going for many years to come. No matter how wet or cold you get throughout the seasons, we aim to ensure that you can warn up and dry out in front of a roaring log fire. 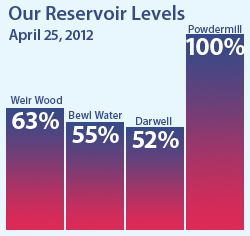 Southern Water has just published its up-to-date reservoir levels on its website. As a result of the current very heavy showers, water is constantly cascading over the overflow at Powdermill and many thousands of gallons are being lost. Visit the Southern Water website for the latest water levels and the news about the drought. READY, STEADY... BUT NOT GO YET! While awaiting for the latest delivery of fish this morning, the bailiff claims to have seen a lone mayfly struggling off the water at the far end of the dam. It was immediately whisked away by the strong wind blowing in a north easterly direction towards the dam. As it was the only one seen today cynics will claim that it was probably yet another olive, as the bailiff's eyesight is not very good these days (he has to wear glasses to do his sudoku puzzles). When we get a genuine mayfly hatch subscribers to our email newsletters will be the first to know. However, please bear in mind that the bailiff likes to be the first to catch on a dry mayfly. 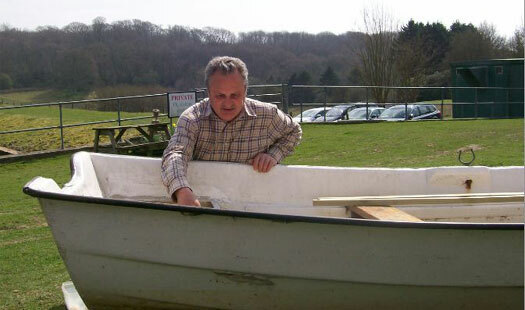 Despite the wind and waves, Martin Brignall, fishing from a boat this morning, still managed to catch his six fish and was back home in the afternoon to tend to his sheep and lambs. Because of the awful weather forecast only two anglers had ventured out in boats and three other misguided anglers tried to find shelter along the banks. The dam itself was too uncomfortable today. Despite this, all five anglers caught fish. What happened in the afternoon was of no interest to your intrepid reporter who had decided to go home after witnessing the fish delivery. 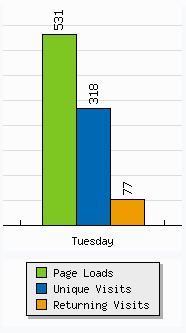 This was primarily due to the wood burner in the lodge having gone out. To make matters worse, the coffee had run out, with new supplies not due until the following day. This was as a result of a lack of communication between the bailiff and 'Woodie' (the beverage supremo). To add insult to injury, the bailiff had finished off the last of the chocolate Hobnobs. The fish delivery arrived at midday, during the height of the wind, and as soon as they were uncerimoniously dumped into the reservoir the trout were engulfed by the waves. 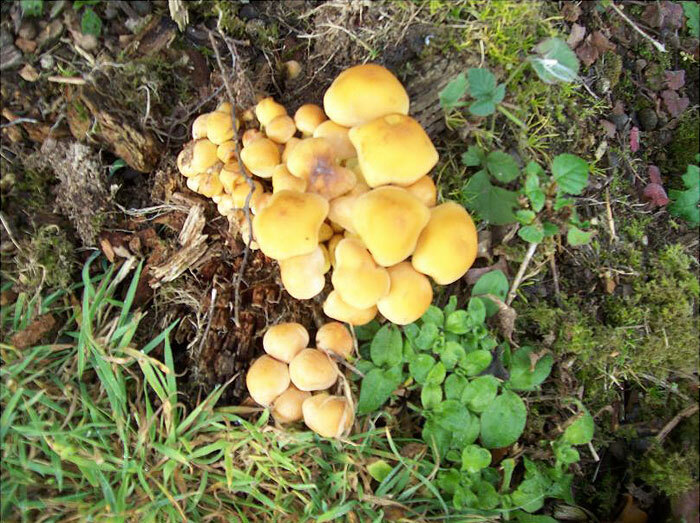 This batch were mostly around the 2lb mark and looked to be in exceptionally fine condition. One evening this week when all the anglers had left and the water was flat calm the bailiff reported that fish began rising all over the reservoir as they gently sipped something off the surface. These reports just served to fuel the nervous anticipation of the dry-fly aficionados who cannot wait for the first sign of a mayfly hatch. If things do not hot up next week, they certainly should the week after. The prevailing weather will obviously play its part in determining how early the first mayfly will appear and at present the poor fishermen are experiencing some heavy showers in between the glorious sunshine. Please bear in mind that just because its raining where you are, it does not follow that its a bad day at the reservoir. Conversely, on Thursday anglers got soaked and had to dry out in front of the fire in the lodge while three miles down the road in Westfield they never saw a drop of rain and the sun shone all day. Typical April weather! Oh, and by the way, the reservoir is now full, with water going over the overflow back into the Brede river. Its a pity that we cannot send our surplus to Darwell and Bewl. Fly Of The Year has now been updated. Visit the The Fly of the Year page for more information. All the brown trout in the reservoir are native fish. We have not stocked brown trout for many years. Despite the poor state of the spawning grounds along the streams feeding the reservoir they continue to manage to reproduce and browns of all sizes are regularly caught. About a dozen have already been caught and returned this season. In order to preserve our native stock we should remind you that all brown trout must be returned. Please treat them with great care as these fish are precious and to catch one is a great privilege. 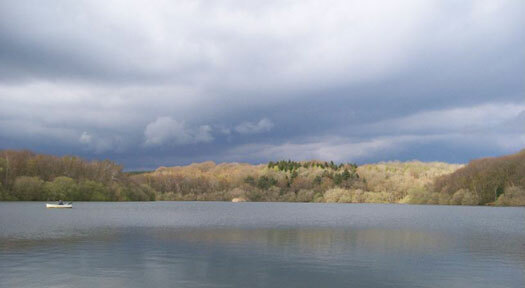 Anglers have risked getting a soaking during the past few days as storm clouds pass over the reservoir with the occasional rumble of thunder. The April showers are interspersed with periods of glorious sunshine typical of this time of year. Bank anglers adjacent to the clubhouse have enough time to reach safety before risking getting wet, but boat anglers rarely get back in time. Wednesday afternoon saw six dripping boat anglers drying off in front of the fire in the clubhouse only for conditions outside to rapidly improve tempting a couple of the hardier souls to venture out again. Despite these distractions, most anglers caught fish. Club members are resorting to short sessions in between showers, catching two or three fish. 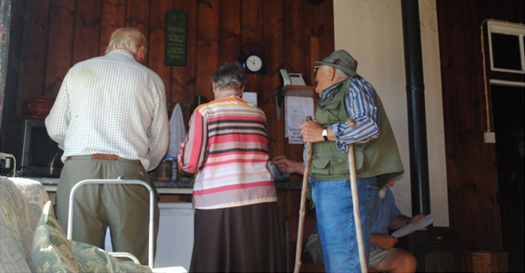 Visitors tend to feel that they have to stay the course having had to pay for a day or half a day's fishing. The result is that members appear to have a worse rod average than one would expect, but this is simply as a result of shorter sessions. A wide variety of flies are catching fish and even though the damsel appears most often in the returns book, this description covers a multitude of patterns. Lines also vary with both floating and intermediate lines proving equally successful. Because most fish are still around the margins there is certainly no need to use faster sinking lines. Both boat and bank anglers are proving to be equally successful. This time of year certainly gives the angler an opportunity to try something different and still have a good chance of success. So now is the time to experiment before the onset of the mayfly hatch has us all switching to the prescribed methods. The minute we see the first mayfly hatch we will let all our e-mail subscribers know so make sure that you have subscribed to our occasional newsletter. Go to the bottom of our Homepage or our Mailing List page to join the 325 existing subscribers. We now also have a Facebook page where you can ask questions, share stories, and add your own photos. "Like" us on Facebook today. 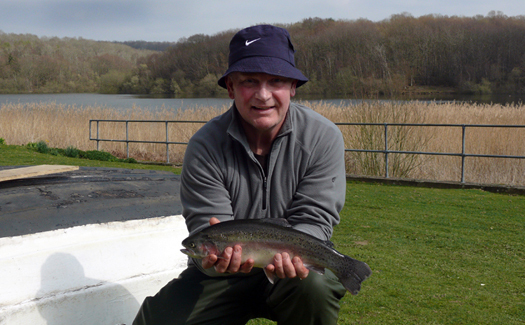 Regular visitor, Colin Fagg (below), has already fished at Powdermill a few times this season and on his last visit in March caught this rainbow of 5lb 7ozs. Much to our surprise, it was the largest fish to be caught during the whole of March. His six fish limit weighed a total of 16lb 2ozs which were caught from a boat using a Montana on an intermediate line. So why were we surprised? Well, we were expecting this to be easily beaten having seen the superb fish on our last delivery. What will be caught during April? No sooner was boat number 7 back in the water than it was out again. Yet another leak! It's urgently required for the busy period next month but after that we will have to give it a complete refit. Have we been the victims of fly-tipping? Well, many visitors naturally assumed so when they were confronted with our latest acquisition. Is it a rusty old four-drawer filing cabinet? 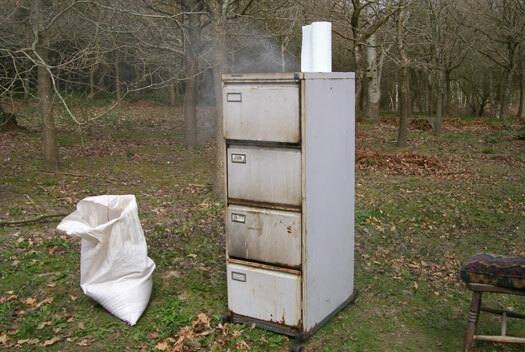 No, certainly not, it is apparently a state of the art smoker! 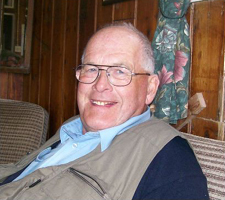 Neighbours surrounding Alec Chisholm's garden were complaining about the amount of toxic fumes he was generating. As a result he decided to re-locate this monstrosity to a prominent position at the reservoir where it could blend in with the beautiful rural idyll and, when in operation, would further enhance peoples enjoyment of the bracing fresh air. The amount of smoke generated is truly amazing and resulted in the assorted cooking 'helpers' coughing and spluttering all over the fish. But why worry.... no one cleans the smoker from one day to the next and heaven forbid that anyone should consider washing their hands. The method used to damp down the sawdust beggars belief. The fish fillets that emerge from this 'smoker' are surprisingly good despite the apparent lack of hygiene employed in the smoking process. Your intrepid reporter risked food poisoning to sample a couple of fillets today and has to admit that the results are remarkably good. Our visitor from the Orkney Isles, Jim Adams, used a Panasonic Lumix DSLR camera, to take these excellent photos of Keith Blundell playing a rainbow. 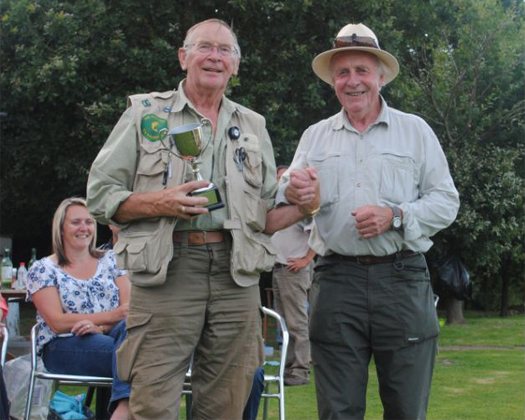 Keith is the current holder of the Darwell Cup for the largest fish caught by a club member each year. The fishing statistics for March have now been updated. Visit the Fishing Statistics page for more information. This morning (Thursday 5 April) we saw the first swallow over the reservoir. At the time we were in the lodge with the log fire blazing in order to keep out the cold. A few insane anglers had braved the icy wind determined to suffer. The poor swallow must have wondered what on earth was happening to the weather. We did manage to brave the cold to trim back one of the trees behind the willow on the west bank. We had to laugh at some of the flies that we rescued from the branches, all of which would not look out of place on a Christmas tree. Someone had even tried to copy the infamous Orange Fritz so beloved by a certain 'angler', but it was a pathetic imitation which now resides in the bailiff's hat. There is only one man who can make the genuine article. With the weather over the Easter holidays looking decidedly colder than of late it may be a good time to stay indoors and prepare some mayfly patterns ready for next month. Or you could join the more hardy (or foolish) amongst us and brave the elements. After all, you can still be successful despite the weather, as regular visitor Colin Fagg proved today by freezing in a boat to catch his limit by lunchtime. Hopefully, our lone Swallow will survive the cold spell and grace us with his aerobatics over the reservoir during the next few months. Boat anglers at Powdermill claim to have heard a cuckoo today (Wednesday 4th April). This is reasonable as adults start to arrive from late March or April. Norman Harle is lucky to hear anything with his less than effective hearing aid. However, this does mean that you can creep up on him without him realising and take candid photos of him hooking and landing yet another hard fighting rainbow when other lesser anglers are struggling. Jim Adams travelled down from the Orkney Islands to visit his daughter who now resides with her husband in the sunny SE. Being the Web Manager of the Orkney Trout Fishing Association he naturally looked on the web for local venues and found us. 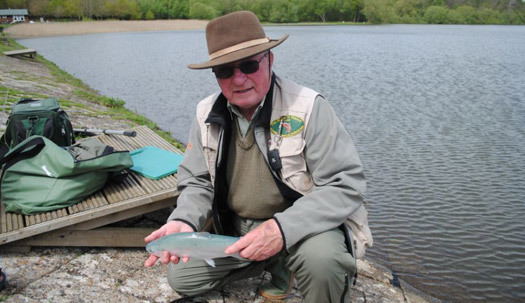 Needless to say the fishing at Powdermill is different from what he is used to but once Jim was given one of the many flies which do well on our reservoir he soon caught three fish. The last raft of repairs is currently being undertaken on the last two boats which should be ready to launch shortly. 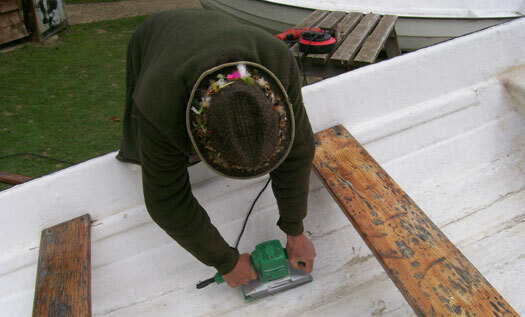 Boat 7 requires extensive repairs and a master craftsman had to be called in to undertake the construction of the wooden framework prior to being fibre-glassed by the bailiff. 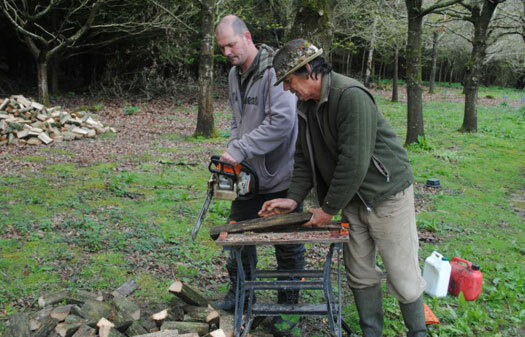 Members are being constantly amazed at the wide variety of skills demonstrated by the master craftsman who can work miracles with wood, even without a chainsaw. Known to the angling underworld as the "Fishmonger", this dastardly and elusive fisherman was photographed in the act of hauling-in yet another specimen fish destined for the table of some unsuspecting innocent customer, unaware of the diabolical methods being employed to capture these beautiful fish. Although only one of many "Kentish mongers", who come from as far away as Dungeness, he is by far the most notorious. These photos were taken by your intrepid reporter, at great risk to himself. These "anglers" carry out forays from over the border in Kent and disappear just as quickly from whence they came, taking their ill-gotten treasures with them to sell to the highest bidder. It is believed that this trade is used to fund other criminal activities such as purchasing fast cars and race horses, throwing wild parties and even obtaining exotic foods from Sainsbury's at a discount. If you see this man or any of the other Kentish "mongers" we advise that you do not approach them but inform the bailiff. With the excellent fishing being provided by Hastings Fly Fishers and the rumours that double figure fish are now swimming around ready to be caught by the luckier anglers, it was inevitable that the number of "fishmongers" from across the boarder in Kent would become a serious problem. Your intrepid reporter is prepared to risk reprisals and publish pictures of some of these reprehensible characters and even managed to photograph one hauling in his ill-gotten bag of monsters. Do not approach these anglers and do not seek advice from them as you are likely to be told a pack of lies. Wherever they tell you to fish or whatever method they recommend you use.... do the opposite! 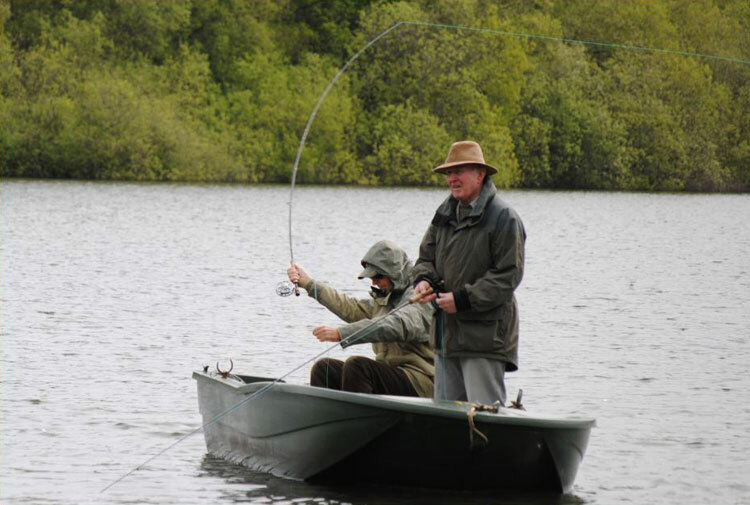 Although decent anglers use floating lines, these men can be seen using intermediate or even sinking lines and flies which would give the bailiff apoplexy. Rumour has it that some Sussex anglers are striking back by using orange fritz flies which are also strongly disapproved of by the bailiff who is becoming extremely concerned at the total lack of discipline being displayed by everyone as the fishing frenzy continues. This is an appeal to return to floating lines and imitative miniature flies to give the poor fish a chance. 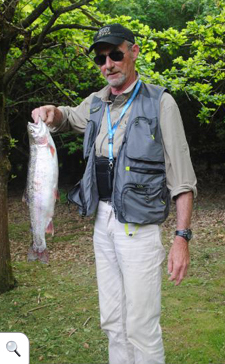 More 3lb+ rainbows have been caught already this month than in any month since records began at Powdermill. 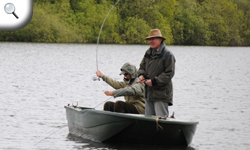 The superb fish that have been stocked this year are providing wonderful sport. Any fish under 2lb are invariably over-wintered stock which have lost a few ounces but are in fighting fit condition. Fish are proving to be well spread around the reservoir and are close in to the banks. Both intermediate and floating lines have been equally effective and anglers are using a wide variety of flies. 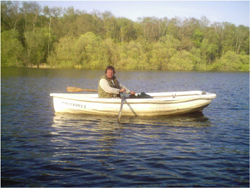 Both bank and boat fishermen have been successful, but wind direction can sometimes favour the use of a boat. The forecast for this week is for more settled weather with no rain and light breezes, which sounds ideal for fishing. So if you need some angling therapy laced with periods of high excitement there is only one place to be! What a glorious opening day, with shirt sleeve weather and spectacular fishing! Plenty of three pounders and bag limits were the order of the day. A number of anglers commented on how surprisingly hard the fish fought and it was particularly pleasing to see a significant number of over-wintered fish being caught which were all in super condition. A wide variety of flies were successfully used (please see Returns book in weighing room). Alec Chisholm (photo) was one of the first anglers to take to the water on Thursday and he and his boat partner, Mick Wood, both had their six fish limit. We were also pleased to see that all visitors caught fish. 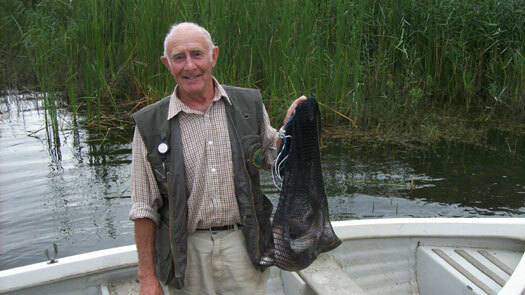 Regular visitor, Brian Braun, was the first angler to catch his limit, fishing from a boat off the reed beds near the jetty. However, the fish proved to be well spread and bank fishermen found fish all along the dam as well as on the far bank and by the willow tree. Although the weather conditions are likely to be very variable this month we do not expect the fishing to suffer and weekly restocking will be the order of the day from now on. So, don't delay, now's the time to take advantage of some super early season fishing at Powdermill. 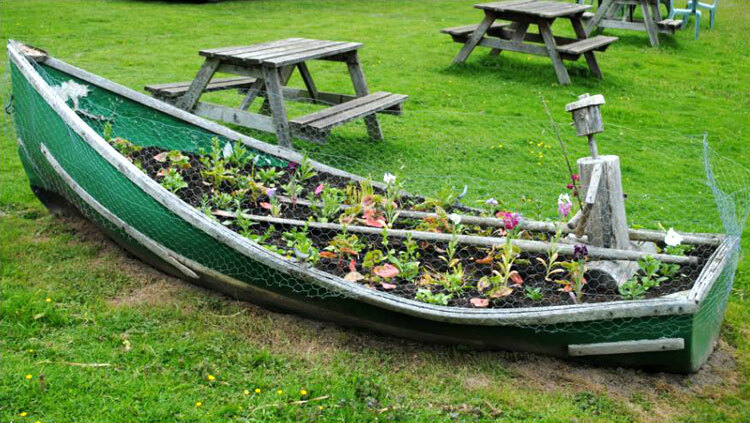 With the mild weather predicted for the opening day of the new season comes the rumour that there could be a shortage of boats. This is because the weather so far this year has not been conducive to outdoor boat maintenance and not all our small fleet are ready to be launched. So if you want a boat please book early to avoid disappointment. However, if the weather turns too cold to fish, we can now offer a comfortable alternative. 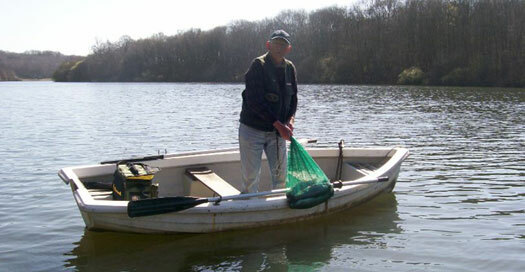 Yet more fish arrive for the start of the new season which begins on Thursday 1 March. This time we played safe and took them to the reservoir via Southern Water's access route to the valve tower rather than through the main entrance. Despite being steep and having to reverse the vehicle back downhill, it was preferable to getting stuck trying to get onto the dam. More deliveries are due before the season start. The water level is only two foot three inches short of the maximum and water is still being pumped in from the Brede river, so we hope that it will soon be full. 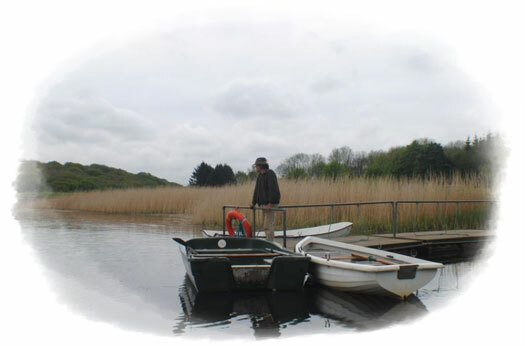 Water clarity is also very good compared to last year and the water is cold - ideal conditions for the trout so the start of the 2012 season looks set fair. As the fish were being unloaded, high up in the sky above us were no fewer than six buzzards performing awe inspiring acrobatics in the thermals; coots argued among themselves along the dam and a deer ventured into one of the clearings on the far bank. In the unseasonal sunshine it is easy to believe that all is well with the world, or at least it is here in paradise. Make a date to visit us next month, we can almost guarantee that you won't be disappointed. Our first delivery of fish was delayed due to the snow and frozen reservoir only to finally arrive to get bogged down in the mud. 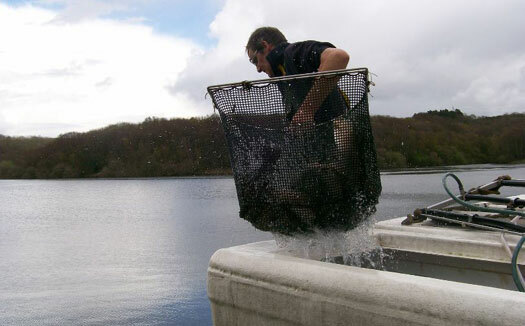 In the end, the fish had to be carried along the dam in a large bucket, as it proved impossible to manoeuvre the heavily loaded truck and trailer. Even when the five tanks were emptied it was touch and go as to whether the vehicle could be extracted from the mud. Fortunately, the fish showed no signs of distress and were in superb condition. 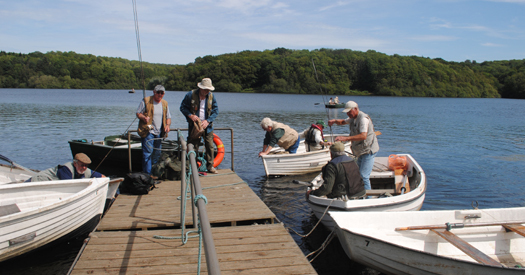 A quarter of the consignment were fish of over 3lb while the remainder were all 2lb+. With the end of the big freeze in the South East we can hopefully look forward to some better weather for the start of our fly fishing season on 1st March. Our first stocking had to be postponed as the reservoir was frozen and the first delivery is now arriving this Friday 17th February. The month of March normally produces the best rod averages and, given no more bad weather, we expect anglers to be able to enjoy some excellent early season fishing. We must apologise to those of you who have had difficulty when phoning the lodge over the winter period. This was due to an intermittent fault with our phone system. We have resolved the problem by installing a new, sophisticated, state of the art communications system, which is now fully operational in good time for the start of the new season. You should therefore no longer have any difficulty in contacting the bailiff between 9.30 and 10.30am. (01424 - 870498). However, if you are really lucky, he will be otherwise occupied and your call will be dealt with by one of the more 'helpful' fair-weather club members who hang around the lodge drinking coffee. These people are a fund of useless and misleading information, but please be patient as they mean well and would otherwise probably have to go to a Local Authority Day Centre to be looked after at even greater cost to the taxpayer. Yes . . . it really is true. All prices are frozen for yet another year. After a very uneventful and disappointing 2011 season, we are looking forward to a better 2012. Last year we were faced with a serious lack of water for most of the season as Southern Water were forced to extract water from Powdermill early on in the year due to problems at Darwell. The lack of significant amounts of rain meant that the reservoir stayed dangerously low for most of the year. For nearly all the year the aerator was out of action and as a result water temperature became a cause for concern. Although we kept on stocking throughout the latter part of the season, the fish simply were not being caught. Recently Southern Water have resolved the problem at Darwell and are pumping water in from the river Brede and Powdermill is well on the way to reaching full capacity. With the aerator now fully operational everything looks set fair for the start of the new season on 1st March. We plan to stock heavily during February to ensure that we get off to a good start in March and will continue to stock weekly from then on. Given normal conditions, 2012 should prove to be a year to remember. 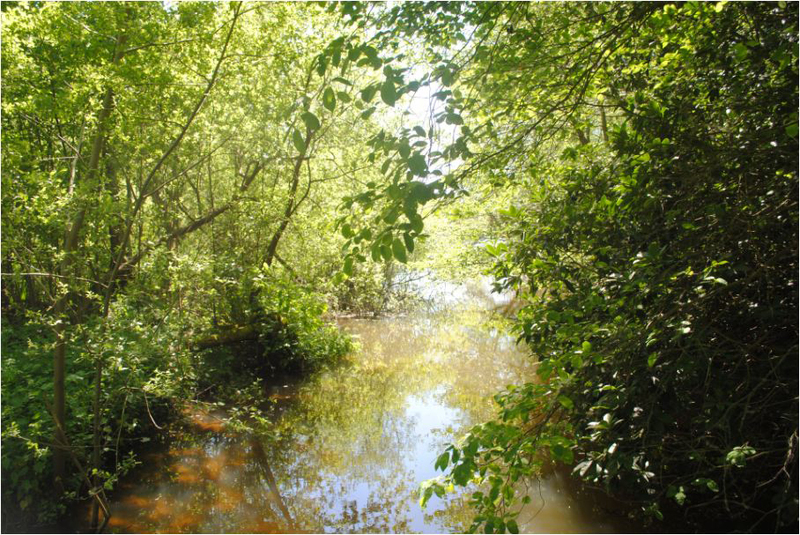 We hope that, in 2012, you will have the opportunity to enjoy what is arguably the most beautiful trout water in the South East.